One of the hardest decisions a bride has to make is picking her hairstyle. Ultimately, there are so many ways you can go: do you have it up or do you have lose beach waves? At the end of the day, almost any hairstyle you pick will look absolutely flawless. The only hard part is making sure you’ve covered all the endless possibilities! So, to help make your hair style hunt go as fast as possible, we’ve put together 6 of our favourite looks so you can be sure you didn’t miss a style! There are so many different ways you can go with beach waves. Have it completely down, have it half up, or even add a headpiece! 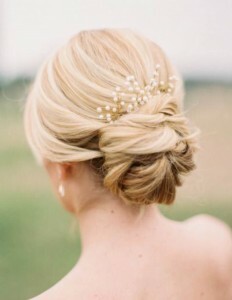 This charming hair style looks great on just about any bride! You can never go wrong picking this timeless hair style. 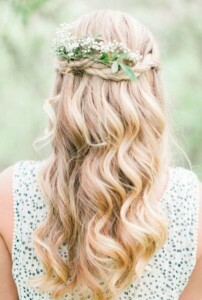 You can even change it up by adding a simple head piece! This hair style takes elegance to a whole new level. 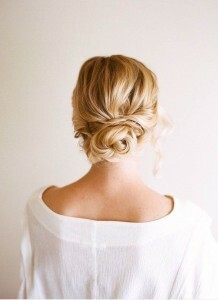 If you don’t want to stick to the classic up-do, this hair style is the way to go. Just when you thought it couldn’t get more flawless, top it off with a beautiful floral headpiece! 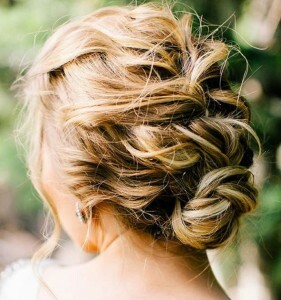 If you’re looking for a unique loose up-do, the messy french braid is for you! This hair style looks absolutely flawless with a veil and best of all, it’s easy to do! If you’re leaning towards the classic, bun but want something a little more unique, then check out this hairstyle! This chic hair style is surprisingly easy to do yourself and holds well late into the night! Lots of brides are still rocking the side bun. This beauty of this timeless look is that it’s perfect for both formal or casual weddings!